A rapid, robust way of isolating viable adult epithelial stem cells from human skin is described. The method utilizes enzymatic digestion of skin collagen matrix , followed by plucking of hair follicles and isolation of single cell suspensions or tissue fragments for cell culture. 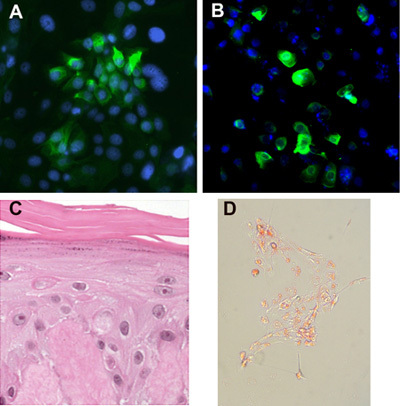 Guo, Z., Draheim, K., Lyle, S. Isolation and Culture of Adult Epithelial Stem Cells from Human Skin. J. Vis. Exp. (49), e2561, doi:10.3791/2561 (2011). The homeostasis of all self-renewing tissues is dependent on adult stem cells. As undifferentiated stem cells undergo asymmetric divisions, they generate daughter cells that retain the stem cell phenotype and transit-amplifying cells (TA cells) that migrate from the stem cell niche, undergo rapid proliferation and terminally differentiate to repopulate the tissue. Epithelial stem cells have been identified in the epidermis, hair follicle, and intestine as cells with a high in vitro proliferative potential and as slow-cycling label-retaining cells in vivo 1-3. Adult, tissue-specific stem cells are responsible for the regeneration of the tissues in which they reside during normal physiologic turnover as well as during times of stress 4-5. Moreover, stem cells are generally considered to be multi-potent, possessing the capacity to give rise to multiple cell types within the tissue 6. For example, rodent hair follicle stem cells can generate epidermis, sebaceous glands, and hair follicles 7-9. We have shown that stem cells from the human hair follicle bulge region exhibit multi-potentiality 10. Stem cells have become a valuable tool in biomedical research, due to their utility as an in vitro system for studying developmental biology, differentiation, tumorigenesis and for their possible therapeutic utility. It is likely that adult epithelial stem cells will be useful in the treatment of diseases such as ectodermal dysplasias, monilethrix, Netherton syndrome, Menkes disease, hereditary epidermolysis bullosa and alopecias 11-13. Additionally, other skin problems such as burn wounds, chronic wounds and ulcers will benefit from stem cell related therapies 14,15. Given the potential for reprogramming of adult cells into a pluripotent state (iPS cells)16,17, the readily accessible and expandable adult stem cells in human skin may provide a valuable source of cells for induction and downstream therapy for a wide range of disease including diabetes and Parkinson's disease. Before starting the procedure of isolating epithelial stem cells one needs to prepare the respective medias and reagents (see table1). Fresh adult human scalp skin from facelift procedures or punch biopsy is collected, then incubate in DMEM / 10% FBS / Dispase (4 mg/ mL) overnight at 4°C. Incubation for 2-4 hr at 37°C is also effective. Skin pieces should be a maximum width of 1 cm to allow for enzyme to penetrate. Transfer the skin into a sterilized Petri dish, pull off each hair from the skin by grasping the hair shaft near the skin surface and pulling firmly and smoothly. Select follicles at telogen stage based on their morphology under a dissecting microscope, cut out the bulge region (Figure 1A) transfer follicles into a 15 mL sterilized tube. Anagen follicles can also be used if cut at upper 1/3 of follicle to obtain hair follicle "bulge" region (Figure 1B). Incubate the isolated follicle fragments in a mixture of 0.05% trypsin-EDTA (GIBCO) and Versene (0.53 mM EDTA 4Na, GIBCO) (1:1) for 15-20 min at room temperature with shaking periodically, add 4 mL DMEM + 10% FBS to stop reaction, spin down for 5 min at 800 rpm. Alternatively, follicle tissue fragment explants can be placed in culture without trypsin digest to culture cells from single follicles. Discard supernatant carefully (save ~0.2-0.5 mL to avoid losing cells) and re-suspend in 1 mL KCM (keratinocyte medium), without EGF. Before culturing the epithelial stem cells, mitomycin C-treated 3T3-J2 cells (feeder cells) should be prepared as following. 3T3-J2 cells are cultured in DMEM with 10% FBS before treatment. Remove culturing media and wash cell twice with PBS, treat cell with 15μg / mL mitomycin C in DMEM without serum for 2 hr at 37°C, 5% CO2. Remove the mitomycin C-containing DMEM and wash twice with PBS, the cells are ready to use. (Mitomycin C-treated 3T3-J2 cells can also be prepared previously and stored at -80°C. Thaw and seed the cells one day before culturing primary epithelial stem cells, incubate at 37°C, 5% CO2. 150,000-200,000 3T3-J2 cells per well of 6-well plate is recommended. Seed isolated hair follicle stem cell from step 1.5 on mitomycin C-treated 3T3-J2 cells in KCM without EGF overnight at 37°C, 5% CO2, changed to EGF-containing KCM the next day. Cells are grown at 37°C in a humid atmosphere containing 5% CO2. All keratinocytes are fed with KCM containing EGF every 2 days and grown for 14-20 days. Check cell every day under microscope. Hair follicle stem cells will form colonies (Figure 2A). Hair follicle explants will form outgrowths after 10-14 days (Figure 2B). Wash cells with PBS once. Remove 3T3-J2 feeder cells by Versene (pre-warmed to RT) treatment. Incubate culture dished in Versene for 5 minutes, then gently shake and aspirate off feeder cells. Wash hair follicle stem cells with either Versene or PBS one time. Add pre-warmed (to 37°C, critical) trypsin-EDTA (2X) and incubate at 37°C for 7 minutes or longer if necessary for the hair follicle stem cell to detach. No longer than 15 minutes is best. Add KCM w/o EGF to stop the trypsin, gently pipette up and down to disperse cells, spin down at 200g, 5 minutes. Re-suspend cells with KCM without EGF, Count and re-plate on mitomycin C-treated 3T3-J2 cells layer. Primary cells, even adult stem cells, reach senescence after serial passage and months in culture. Immortalization of primary stem cells is an effective way to relieve this problem. Plate primary epithelial stem cells (~350,000 cells/well of 6 well plate) at passage 1 on feeder layer (3T3-J2) and culture for 2 days. Culture PA317 LXSN 16E6E7 cell line one day after seeding the primary epithelial stem cells with DMEM containing 10% FBS. (This line produces the amphotropic retrovirus LXSN16E6E7 which encodes the HPV16 E6 and E7 open reading frames, and which can be used to stably infect and immortalize many cell types). Treat PA317 LXSN 16E6E7 cell line with mitomycin C for 2 hours (Same protocol with 3T3-J2 cells). Add mitomycin C treated PA317 LXSN 16E6E7 cell line to the primary epithelial stem cells, co-culture for 6 days in KCM with EGF. Renew fresh KCM with EGF media every 2 days. Remove 3T3-J2 and PA317 LXSN 16E6E7 cell with Versene. Add mitomycin-C treated 3T3-J2 NHP cells (neomycin, hygromycin, puromycin resistant, ~200,000 cells per well) to the epithelial stem cells. Cells are selected under 0.2 mg/ mL of G418 (Gibco) for additional 6 days. Renew fresh G418 containing KCM with EGF media every 2 days. Surviving epithelial stem cells will be immortalized stem cells. A well of primary epithelial stem cells which are not co-cultured with PA317 LXSN 16E6E7 cell should be set as a control for G418 selection, all the cells in this well should be killed by G418 after 6 days of selection. Early passage of skin epithelial stem cells and immortalized epithelial stem cells form tight colonies consisting of small keratinocytes (Figure 2A) surrounded by feeder cells. If cultured in serum free media with defined supplements, without a feeder layer, the stem cells will disperse and not form tight colonies (they grow as single cells and small clusters). Immortalized epithelial stem cells maintain a stable phenotype for >12 months of continuous passage, but tended to form tighter colonies than the primary cells. They do not form anchorage independent colonies in soft agar assays, indicating that these immortalized cells do not possess the characteristics of cancerous cells. Both primary and immortalized epithelial stem cells express hair follicle stem cell marker cytokeratin 15 (Figure 3A), and are able to differentiate into epidermal, hair follicle and sebaceous lineages (Figure 3B-D). Figure 1. Plucked hairs. 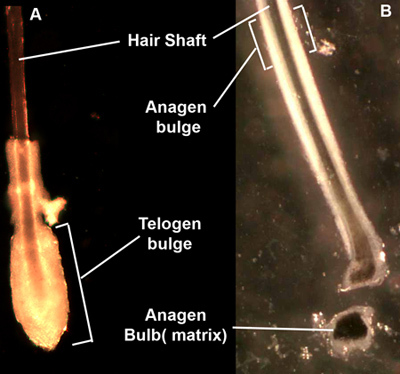 After plucking from dispase-treated skin, hair follicles appear as either telogen club hairs (A) with a ball of cells surrounding the bottom of the hair, or anagen hairs (B) with a sleeve of epithelium surrounding the length of the hair. The telogen bulge region forms a distinct morphologic region to micro-dissect, while the anagen bulge is less distinct. The anagen bulb contains matrix keratinocytes, representing transit-amplifying cells that can also be isolated and cultured. Figure 2. Stem cells cultures. (A) Epithelial stem cells from skin form tight epithelial colonies (designated by E) when cultured in KCM with a feeder layer of cells (designated by F). (B) Hair follicle explants give rise to epithelial outgrowths. The telogen bulge region (designated by T) is attached to the dish and surrounded epithelial cell colony along with feeder cells. Figure 3. Stem cell differentiation. (A) Stem cells colonies maintain expression of epithelial markers such as cytokeratin 15. (B) Skin epithelial stem cells can be differentiated along the hair follicle lineage as determined by K6Hf expression. (C) The cells can be cultured on de-epidermalized dermis or other matrices at the air-liquid interface and will form a stratified epidermis with cornified layer, granular layer and spinous layer. (D) Stem cells can be induced along the sebaceous lineage with Oil Red positive globules. The cell extraction and culture methods described are surprisingly facile and reproducible. We have generated epithelial stem cell cultures from dozens of individuals across a broad age range, including patients with inherited skin defects18. It is best to begin the process on the day of tissue harvest, however cells will remain viable in media on ice for several days, facilitating overnight shipping if needed. Discarded facelift skin yields hundreds of viable follicles for cell extraction as single cell suspensions. For more limited tissue, such as from a punch biopsy of the scalp, explant cultures may be more effective, since there is less chance for cell loss in trypsinization and centrifugation. For explant cultures, the most important aspect is attachment of the tissue fragment to the dish. The addition of small amounts of media just covering the tissue and minimal manipulation is recommended until outgrowths appear in 10-14 days. Adult epithelial stem cells from the skin could have a broad application. Cultured skin cells are already in clinical application for burn patients and chronic wounds. The challenge now has become creating a better skin equivalent with sweat glands and hair. The potential utilization of skin stem cells for hair regeneration is exciting possibility. As mentioned previously, the ability to induce a primitive pluripotent state in adult cells represents a significant advancement for potential cell based therapies without the utilization of embryonic stem cells 16,17. However, the process is inefficient and potentially oncogenic, since viral vectors are used to induce expression of stem cell genes. If one starts with an adult stem cell population, it may greatly increase the efficiency and obviate the need for stable viral transfections to induce pluripotency. Transplantation of bone marrow stem cells has been utilized as a cell-based approach to treat severe skin diseases such as epidermolysis bullosa.19,20 In addition, correction of the collagen 7 defect in epidermolysis bullosa has been achieved in patient keratinocytes in vitro.21 Isolation of epithelial stem cells from a skin biopsy may provide resources to expand on this earlier work and develop individualized cell therapies using autologous cells. It is interesting that the hair follicle bulge region is also the site of other adult stem cell / progenitor cell pools. Xu et al.22 has identified multipotent mesenchymal stem cells from this region. Melanocyte precursors also reside in the hair bulge23. Thus, the hair follicle isolation method presented here can easily be adapted to isolate these other cell types for further experimentation. Jones, P. H., Watt, F. M. Separation of human epidermal stem cells from transit amplifying cells on the basis of differences in integrin function and expression. Cell. 73, 713-724 (1993). Lyle, S., Christofidou-Solomidou, M., Liu, Y., Elder, D. E., Albelda, S., Cotsarelis, G. The C8/144B monoclonal antibody recognizes cytokeratin 15 and defines the location of human hair follicle stem cells. J. Cell. Sci. 111, 3179-3188 (1998). Bac, S. P., Reneha, A. G., Potte, C. S. Stem cells: the intestinal stem cell as a paradigm. Carcinogenesis. 21, 469-476 (2000). Slac, J. M. Stem cells in epithelial tissues. Science. 287, 1431-1433 (2000). It, M., Li, Y., Yan, Z., Nguye, J., Lian, F., Morri, R. J., Cotsarelis, G. Stem cells in the hair follicle bulge contribute to wound repair but not to homeostasis of the epidermis. Nat Med. 11, 1351-134 (2005). Spradlin, A., Drummond-Barbos, D., Kai, T. Stem cells find their niche. Nature. 414, 98-104 (2001). Taylo, G., Lehre, M. S., Jense, P. J., Su, T. T., Lavke, R. M. Involvement of follicular stem cells in forming not only the follicle but also the epidermis. Cell. 102, 451-461 (2000). Oshim, H., Rocha, A., Kedzi, C., Kobayash, K., Barrandon, Y. Morphogenesis and renewal of hair follicles from adult multipotent stem cells. Cell. 104, 233-245 (2001). Morri, R. J., Li, Y., Marle, L., Yan, Z., Trempu, C., L, S., Li, J. S., Sawick, J. A. Cotsarelis G Capturing and profiling adult hair follicle stem cells. Nat. Biotechnol. 22, 411-417 (2004). Ro, C., Roch, M., Gu, Z., Photopoulo, C., Ta, Q., Lyle, S. Multi-potentiality of a new immortalized epithelial stem cell line derived from human hair follicles. In vitro Cell. & Dev. Biol. 44, 236-244 (2008). Ohyama, M., Vogel, J. C. G. ene delivery to the hair follicle. J Investig Dermatol Symp Proc. 8, 204-206 (2003). Sugiyama-Nakagiri, Y., Akiyama, M., Shimizu, H. Hair follicle stem cell-targeted gene transfer and reconstitution system. Gene Ther. 13, 732-737 (2006). Stenn, K. S., Cotsarelis, G. Bioengineering the hair follicle: fringe benefits of stem cell technology. Curr Opin Biotechnol. 16, 493-497 (2005). Hoeller, D. An improved and rapid method to construct skin equivalents from human hair follicles and fibroblasts. Exp Dermatol 10. 264-271 (2001). Navsaria, H. A., Ojeh, N. O., Moiemen, N., Griffiths, M. A., Frame, J. D. Reepithelialization of a full-thickness burn from stem cells of hair follicles micrografted into a tissue-engineered dermal template (Integra). Plast Reconstr Surg. 113, 978-981 (2004). Werni, M., Meissne, A., Forema, R., Brambrin, T., K, M., Hochedlinge, K., Bernstei, B. E., Jaenisch, R. In vitro reprogramming of fibroblasts into a pluripotent ES-cell-like state. Nature. 448, 318-324 (2007). Par, I. H., Zha, R., Wes, J. A., Yabuuch, A., Hu, H., Inc, T. A., Lero, P. H., Lensc, M. W., Dale, G. Q. Reprogramming of human somatic cells to pluripotency with defined factors. Nature. 451, 141-146 (2008). Kazantsev, A., Goltso, A., Zinchenk, R., Grigorenk, A. P., Abrukov, A. V., Moliak, Y. K., Kirillo, A. G., Gu, Z., Lyl, S., Ginte, E. K., Rogae, E. I. Human hair growth deficiency is linked to a genetic defect in the phospholipase gene LIPH. Science. 314, 982-985 (2006). Tola, J., Ishida-Yamamot, A., Riddl, M., McElmurr, R. T., Osbor, M., Xi, L., Lun, T., Slatter, C., Uitt, J., Christian, A. M., Wagne, J. E., Blaza, B. R. Amelioration of epidermolysis bullosa by transfer of wild-type bone marrow cells. Blood. 113, 1167-1174 (2009). Wagne, J. E., Ishida-Yamamot, A., McGrat, J. A., Hordinsk, M., Keen, D. R., Riddl, M. J., Osbor, M. J., Lun, T., Dola, M., Blaza, B. R., Tolar, J. Bone marrow transplantation for recessive dystrophic epidermolysis bullosa. N Engl J Med. 363, 629-639 (2010). Muraue, E. M., Gach, Y., Grat, I. K., Klausegge, A., Mus, W., Grube, C., Meneguzz, G., Hintne, H., Baue, J. W. Functional Correction of Type VII Collagen Expression in Dystrophic Epidermolysis Bullosa. J Invest Dermatol. Forthcoming (2010). Y, H., Kuma, S. M., Kossenko, A. V., Show, L., X, X. Stem cells with neural crest characteristics derived from the bulge region of cultured human hair follicles. J Invest Dermatol. 130, 1227-1236 (2010). Nishimur, E. K., Grante, S. R., Fishe, D. E. Mechanisms of hair graying: incomplete melanocyte stem cell maintenance in the niche. Science. 307, 720-724 (2005). hi there. iam also establishing primary epithelial stem cells. can you tell more about how did you maintain your cells. how you subcultured them? Hi Hayati, We culture them with a feeder layer for about ²-4 weeks, subconfluent. We then remove feeder layers, trypsinize gently and replate at clonal density ~50,000 cells for 75mm flask with mitomycin-C treated feeder cells. The cells are best maintained with feeder layer but can grow in serum-free defined media. hi stephen, tq very much. hi there. thinking on 'cosmetic world', is it possible to afirm that if you treat your skin with ingredients each could improve the stem cell life stile could be possible a youthfull product? to be yourger for a long time? or to face 10 years younger in front of a mirror?